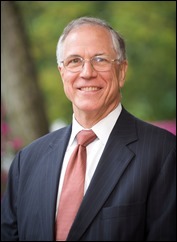 Last Thursday I was visited by Dr. John Haas of the National Catholic Bioethics Center. 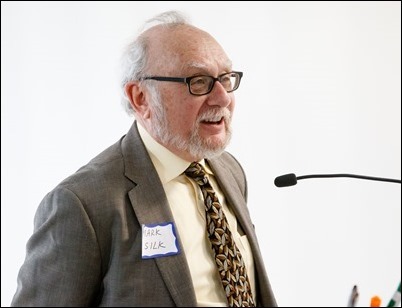 John is an outstanding layman who has made such an important contribution to the field of medical ethics in the United States. 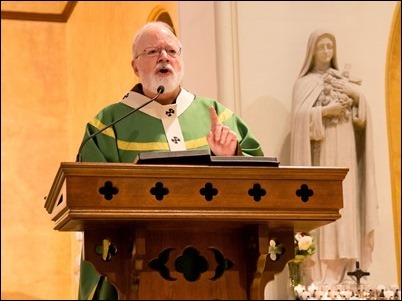 His organization is giving outstanding service to dioceses, Catholic hospitals and other institutions. We are very, very grateful for all that he is doing. 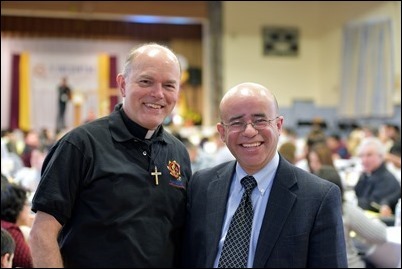 Saturday I went to St. Stephen’s in Framingham to attend our Archdiocesan Encuentro (Spanish for “encounter”). 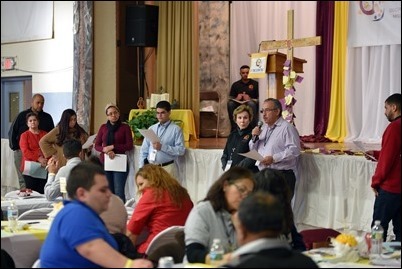 This was a gathering of Hispanic leaders from throughout the archdiocese, as well as many of the priests and deacons from their parishes for a day of prayer, conversation and reflection in preparation for the V National Encuentro on Hispanic Ministry. 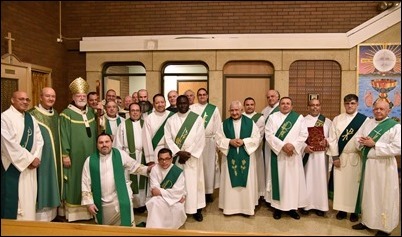 It was a daylong conference for which I celebrated the closing Mass. 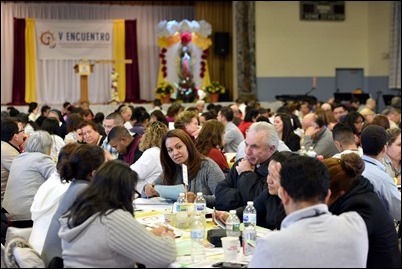 In all of our parishes with Hispanic communities, there have been ongoing meetings and preparations for this local Encuentro, which will lead to a regional Encuentro and ultimately to the national Encuentro. 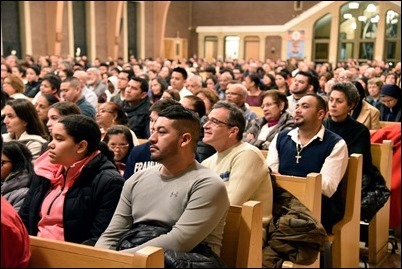 I know people are very enthusiastic and confident that this effort is going to be very helpful in promoting Hispanic ministry and the integration of Hispanic Catholics into the Church in the United States, particularly with outreach to young Hispanics who were born here. I am so grateful to Father Paco Anzoategui, Father Alejandro Lopez Cardinale and Hosffman Ospino for the leadership they have been providing during this whole process. While I was at St. Stephen’s, I took the occasion to visit the new low-power radio station that is headquartered there. 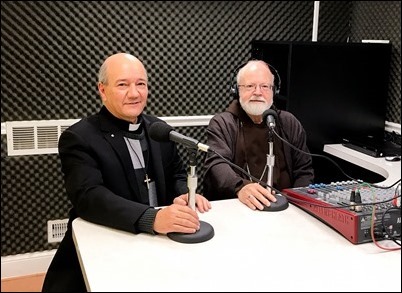 This is one of two local radio stations we began a couple of years ago to help reach our local immigrant populations with Catholic Radio. In Framingham, they broadcast in Spanish and Portuguese and at the other station, in Lawrence, they broadcast in Spanish. In Framingham, there are still some challenges with the signal but we are grateful for all that they are doing, and I know it is an important service to the community. 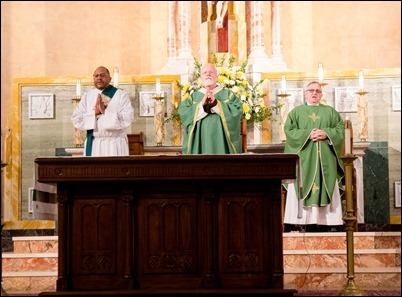 Sunday, I went to St. Michael’s Parish in Lowell to celebrate our Mass of Prayer and Penance for all those affected by clergy sexual abuse. 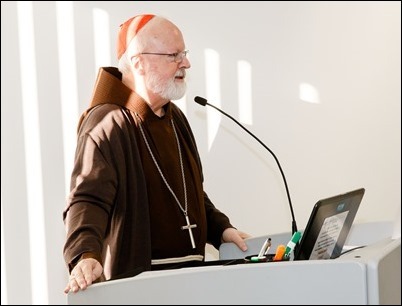 Pope Francis, at the suggestion of the Pontifical Commission for the Protection of Minors, has asked that dioceses throughout the world hold such a Mass. 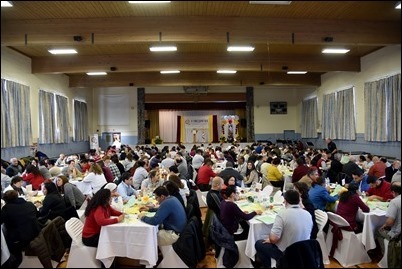 The Holy Father did not specify a particular date, but instead allowed each local bishops’ conference to decide. In the United States, it was left to each bishop to choose the date for his own diocese, and so I chose February 4 for the Archdiocese of Boston. 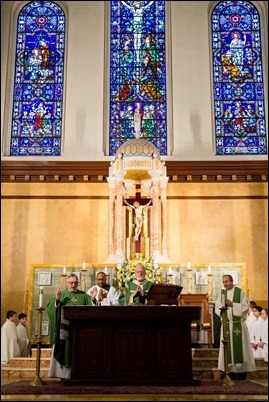 I celebrated the Mass in Lowell because Lowell was very much affected by the sexual abuse crisis. Many people suffered there and, early on, when we had our Novena for Healing and Reconciliation, this is one of the parishes I visited. 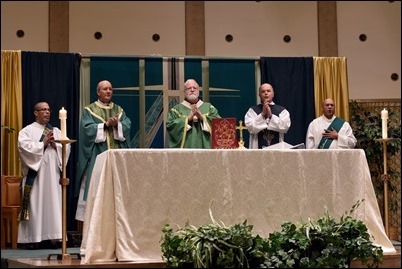 So, it seemed appropriate to return there to offer this Mass and to pray for all of those who have died, committed suicide, or are suffering from substance abuse or any of the many other terrible consequences of abuse. It was a very powerful Mass, and I was particularly touched by the choir that sang some very moving songs around the theme of the Mass. 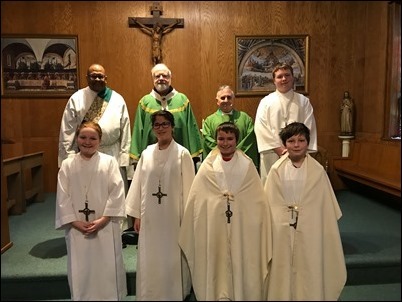 We are very grateful to Father Guy Sciacca, the pastor of St. Michael’s, for hosting us and to Vivian Soper of our Office of Pastoral Care and Outreach for all that she did in organizing the Mass. Jesus’ first cure, his first miraculous healing of a sick person, was of a mother-in-law. The mothers-in-law of the world are often joked about in our popular culture. The Scriptures show us two great women of faith, the mother-in-law Naomi in the Book of Ruth, and Simon Peter’s mother-in-law in today’s Gospel. Today’s Gospel, taken from the first chapter of Mark’s Gospel, presents us a woman who, although anonymous, is Jesus’ first miraculous cure in the Gospels. 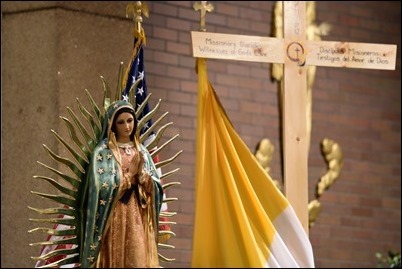 She is perhaps after the Blessed Mother, Jesus first female disciple. She had fallen ill with a dangerous fever, in those days often Malaria, and often fatal. Peter and the others interceded with Jesus on her behalf. They knew that they were powerless to heal her, but they knew that Jesus had the power. As Catholics we believe in intercessory prayer. Jesus’ first miracle was the changing of water into wine. It was in response to Mary’s intercessory prayer and the first cure was that of Peter’s mother-in-law at the intercession of her family. Today, throughout the archdiocese we are joining our prayer to those of all our fellow Catholics as we pray for all those individuals and families affected by sexual abuse. 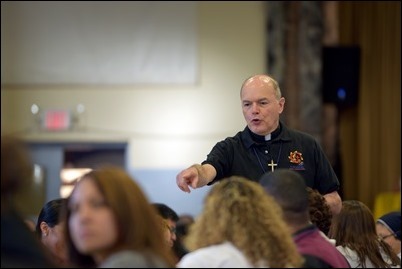 Every diocese in our country has chosen a weekend for such intercession and this weekend is our special time of prayer. I am here today aware that many parishioners in this community were affected. I wish once again to ask pardon and assure you of our commitment to work for healing and reconciliation. 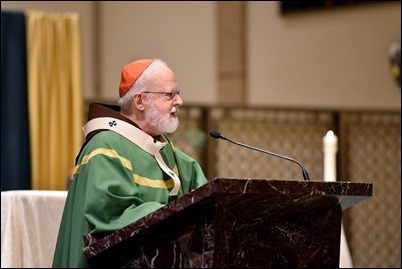 I remember so well the healing service we participated in so many years ago with hundreds of your parishioners listening to the witness of those who were harmed and praying for healing. We are here again today because the work of healing and child protection is an ongoing task, a sacred one. We also want to pray for those who have died from suicide and substance abuse because of what happened to them. In this Mass of Prayer and Penance, we are praying for forgiveness for the Church and for healing for those who are harmed. As a faith community, we must remember our painful history to be sure that it will not repeat itself. We are like the family of Simon Peter and the people who lived in the town of Capharnaum. Theirs was not an easy life; many worked as fishermen. The Romans had conquered their land. But the presence of Jesus of Nazareth in their midst gave them hope. I visited the synagogue in Capharnaum on pilgrimage. It is in that synagogue that Jesus worked many miracles and it was then that he gave his powerful sermon on the Eucharist where he said, “I am the bread that came down from heaven. My flesh is food indeed, my blood is drink. Whoever eats my flesh and drinks my blood will remain in me and live forever.” It is that promise of Jesus that brings so many people to the Eucharist. In today’s Gospel, Jesus and the Apostles go the house of the brothers Simon and Andrew, just as many families shared three-deckers in these mill towns of New England. In Capharnaum families clustered together. You can still visit ruins of the houses of Simon and Andrew connected by a courtyard. It is not surprising that the grandmother, the mother-in-law, lives with them. She put her life in God’s hands and is restored to health. Simon’s mother-in-law is such a good person that as soon as she is cured she just wants to take care of others. The Gospel says she ministered to Jesus and the disciples. She waited on them. In Greek, it is the same word used to describe the angels who ministered to Christ in the desert. The call to serve is what characterizes our life of discipleship. Jesus said, I have come to serve and not to be served. 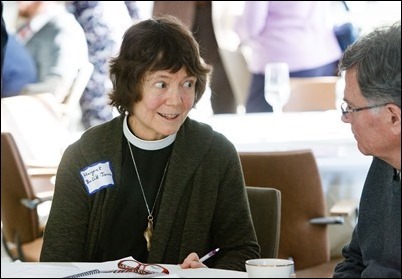 Simon’s mother-in-law becomes such a disciple, one who serves joyfully and generously. This healing did not go unnoticed in the town, and it sparked the first gatherings of crowds around Jesus. It took place on the Sabbath after Jesus returned from the Synagogue. The Gospel says that when it was evening, after sunset, they brought to him all who were suffering. The whole town gathered at the door of Simon’s house. And Jesus cured them. The people had waited until Saturday evening because for the Jewish people the Sabbath began on Friday evening and ended on Saturday evening at sunset. It was only then that they could carry the sick to Simon’s house without violating the Sabbath. We, too, are looking for Jesus; we, too, need his healing love. Martini, a famous Scripture scholar, did a close reading of the four Gospels to determine how Jesus allocated his time. His analysis shows that Jesus’ number one priority was healing. Today’s Gospel says he cured many diseases and drove out many demons. As Jesus’ followers, we want to be a healing community. 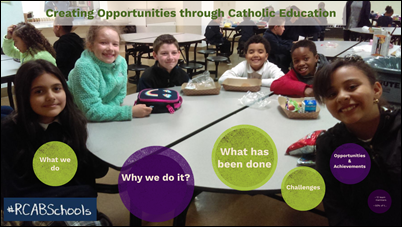 We are grateful to our parish communities, schools, and agencies that work so hard to ensure safe environments for our young people and vulnerable adults. The screenings, training, and reporting are crucial elements in creating safe environments. As a Church, we are committed to providing pastoral care and psychological help to all those victims of clerical abuse. We are so grateful to Vivian Soper and all those working in the Office of Pastoral Support and Child Protection. These services are available to all who may have need of them. The first reading is taken from the Book of Job, it is the story of the suffering of an innocent man. It is a distressing story. It describes a man in a bed of pain wondering if he will even be able to arise. As is often the case for the Sunday readings: the first reading and the Gospel share something. In the Book of Job, the suffering man wonders if he will ever be able to arise. In Mark’s Gospel it is the merciful Christ who takes the hand of a person in pain and restores them to health and peace. 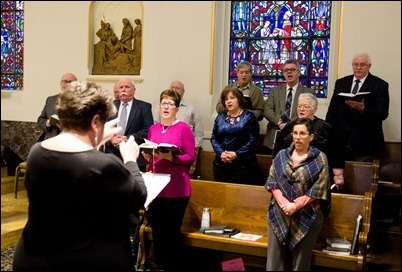 We gather to deepen our faith in the healing presence of our Redeemer and pray for the grace, despite our unworthiness, to participate in his healing mission. All of us are called upon to witness to Christ’s love and mercy. I was very moved to hear about a relief worker who was struggling with his faith in light of all the suffering and darkness he experiences in war-torn and famine-ridden regions. One day, he was involved in a food distribution in a famine area. There had been many riots among the starving people. He was terrified that they would not have enough food to feed the whole throng of people that had gathered, so they kept rationing the food in smaller amounts so they could give something to everybody. At the very end of the line was a young 10-year-old girl with two little brothers. The only thing left was a banana. He handed the banana to the little girl. He was amazed what he witnessed. The little girl quickly peeled the banana and broke it in half. She gave one half to each of her little brothers and then she licked the banana peel. The relief worker said that at that moment he felt the powerful presence of God and his love. As a people of faith, we must try to live our vocation to imitate the goodness and mercy of Jesus, especially to those in need. 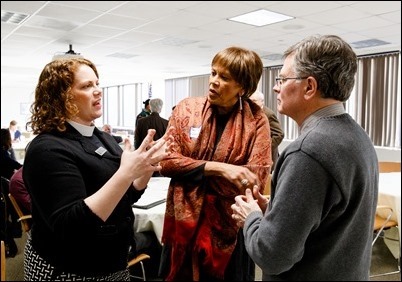 Let our gathering on the Lord’s Day, our Sabbath, be a time for us to deepen our commitment to discipleship whose love, service, and concern for our brothers and sisters in need can be a sign of hope in a world where there is such pain and darkness. God put us on this planet to love and care for each other. The Eucharist is where Jesus calls us to be nourished by His Body and Blood so that we can truly be the Body of Christ. The Gospels often show the contrast between the crowd, which is often a collection of rugged individualists, each with his or her own agenda. The crowd is often an obstacle that pushes people away from Christ. The community is a group of people that are connected in their discipleship and in their desire to be healed and in the desire to serve others. Whereas the crowd pushes people away from Christ, the community helps people on the path, seeking the Lord. Our task is to work to transform the crowd into a community, a caring and healing community. 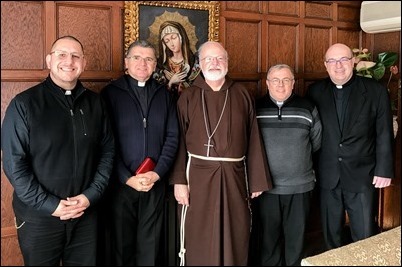 Monday, I was visited by the Father Tarcisio Vieira, the Superior General of the Sons of the Divine Providence (the Orionine Fathers), as well the Vice General and local superiors. Father General was on a pastoral visit to the States, visiting the different works of the Fathers here, so he came by to greet me. It was an opportunity to thank them for the work they do at the Don Orione Shrine and St. Lazarus Parish in East Boston, particularly with our immigrant population. We are very, very grateful for their generosity, their pastoral love for our people and their commitment to the Archdiocese of Boston. 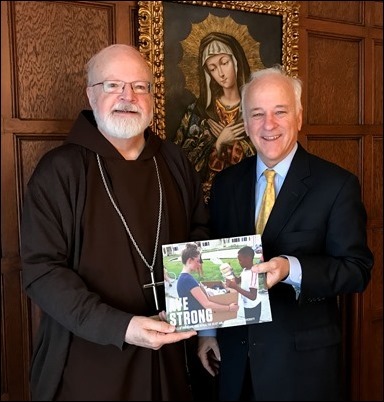 Also on Monday, I was visited by Jim Towey, the president of Ave Maria University in Florida. 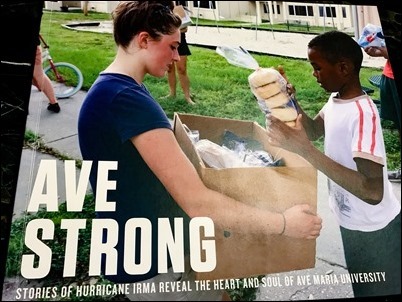 He was anxious for me to see the very generous and energetic response of the students and faculty at Ave Maria to aid those who were affected by last year’s hurricanes. They reached out to all the families in the area who were affected and set up shelters in their athletic facilities and did anything they could to help the people. During our visit, he presented me with this book, which details their efforts. Later that day, I went to the wake of the Connie Daily, the sister of Father Vin Daily who is the pastor of St. Gregory’s Parish in Dorchester. Father Daily had been the primary caregiver for his sister, who was born with Down Syndrome. She was just a wonderful, faith-filled, and loving individual. 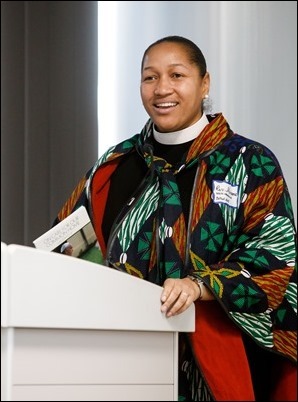 In fact, she figured prominently in one of the films that was prepared for our annual Celebration of the Priesthood Dinner. 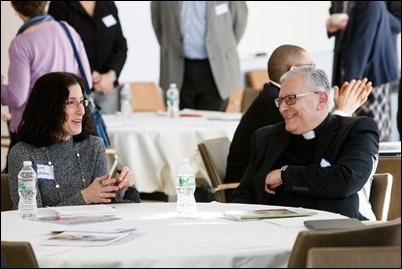 Tuesday, we had one of our regular meetings of the Archdiocesan Pastoral Council. 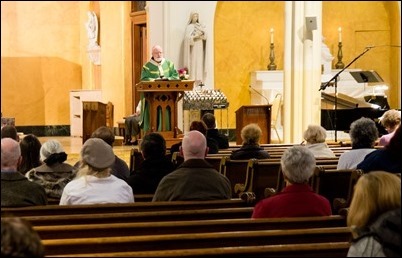 At each of our meetings, we typically invite a guest speaker to speak on a current topic in the archdiocese. This time, we were addressed by Sister Barbara Gutierrez of our Catholic Schools Office, who gave a wonderful presentation on her work to promote Catholic schools and in particular to involve more immigrant children in our schools. Wednesday, I was visited by John Crowley who is the headmaster of St. Patrick’s College in Australia. 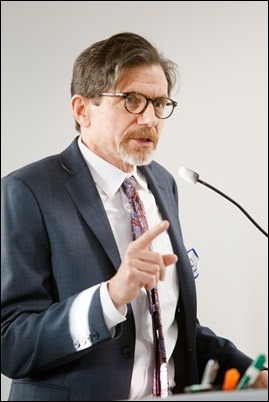 He was in Boston to learn more about our programs around child protection. 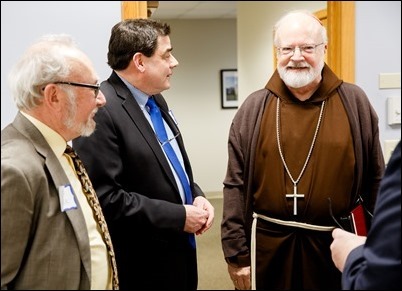 We met together with members of the staff here at the Pastoral Center. We were very happy to share our experiences with him. 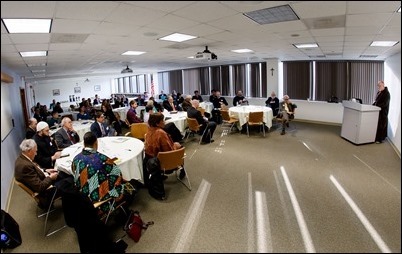 Finally, yesterday and today, I was pleased to welcome a group of local religious leaders, scholars and scientists to the Pastoral Center. 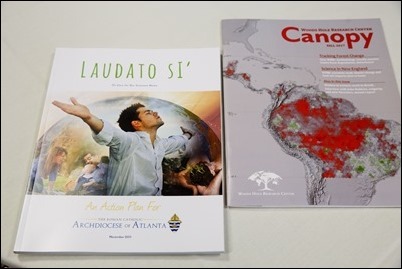 As we approach the third anniversary of the publication of Laudato Si’, the Holy Father’s encyclical on “protecting our common home and the dignity of the poor,” we wanted to explore the potential of forming a coalition of leaders drawn from the religious and scientific communities in Massachusetts to advance those concepts. 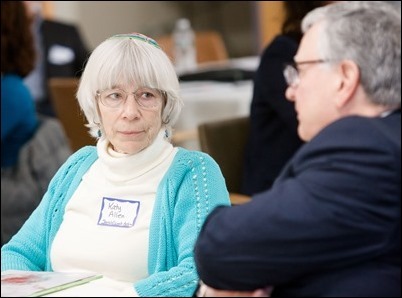 The idea for bringing this group together came from Phil Duffy, the CEO of the Woods Hole Research Center, reaching out to the archdiocese through the good offices of Professor Mark Silk, director of the Greenberg Center for the Study of Religion in Public Life at Trinity College in Hartford. 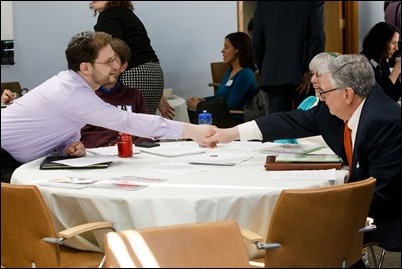 This first gathering provided an opportunity to share experiences, ideas and hopes for what we can do as faith communities and the world of science to make our voices heard. While there have been scientific advisers to religious organizations, and scientists who seek religious inspiration, this would be a unique coalition with the goal of bringing the combined intellectual and moral authority of both groups to the task of caring for our planet. We anticipate that the coalition will seek to continue the conversation and to explore ways we can better pursue public policy proposals related to environmental issues at the state level. We also believe that the coalition can engage in both public education and in partnership with our schools. 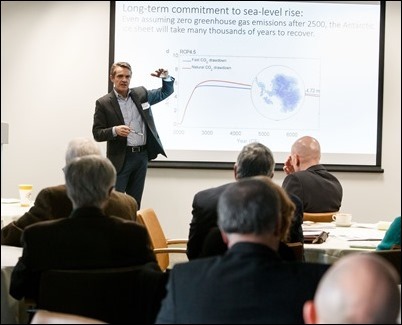 There is no doubt that it will take the insights of all of our religious traditions to complement the work of scientists as well as political, economic and cultural leaders to meet the challenge of our day. There are many ways to examine and explain that challenge. We need the hard science to convince, persuade and engage parts of our society that this challenge is so real and so compelling. We also need the insight of religious traditions to provide both understanding and motivation to the public. 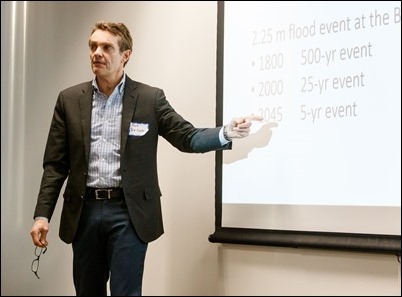 Thank you for taking the climate emergency seriously! Together, we can protect our common home.